Choosing the right snacks can make or break your keto diet journey. When you don’t have keto approved snacks ready in the pantry or refrigerator, you’re prone to using up a lot of willpower trying to resist unhealthy or high-carb snacks. This is especially true if you are living in a household where others are not eating keto. When you’re hungry mid-morning or mid-afternoon, it’s tempting to give in to those cravings. That’s why we believe in preparation. Get your snacks ready ahead of time and grab one of these delicious keto treats when the hunger pangs hit. These low carb recipes will not only keep you burning fat through ketosis, but they’re also easy to put together. The first recipe we recommend trying would have to be these Keto Buffalo Chicken Taquitos by Officially Gluten Free. They’re so simple and so delicious, you won’t even know you’re on a diet. Next, these Keto Jalapeno Mushroom Bites by The Essential Baker will be enjoyed even by non-keto dieters. This cheesy jalapeno and bacon mixture on crimini mushrooms is the perfect combination for a healthy satisfying snack. 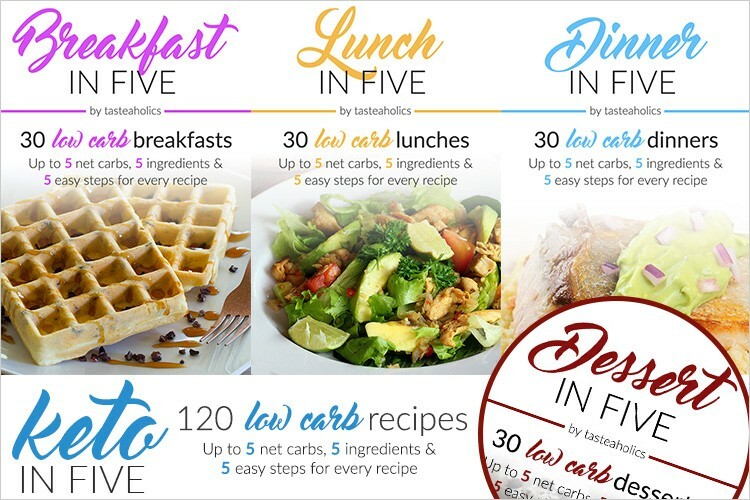 Try Keto In Five Today! You will love these gluten-free Low Carb Tortilla Chips by Wholesome Yum. I’d say they’re the best keto friendly tortilla chips ever. It is a great make-ahead snack idea and perfect for those days when you feel like tortilla chips with guacamole. With only 4g net carbs per serving (10 1.5″ chips), these are sure to keep you in ketosis. It’s also super easy to make with only a few ingredients. What are you waiting for? One of the best things about okra is you don’t have to dunk it in oil to get it crispy. This Oven Fried Okra Recipe (Low Carb, Gluten Free) is a clean healthy snack idea without the greasy taste. Get the recipe here. Whenever you crave something salty and crunchy, reach for these Low Carb Cheez-Its by Real Balanced. This yummy snack can be made ahead and stored in the refrigerator. It’s gluten free, grain free and of course, sugar-free with only 2.2g net carbs per serving. Perfect! Get the recipe here. These Low Carb Maple Bacon Crack squares from Joy Filled Eats are perfect for any meal of the day whether that’s an afternoon snack or even breakfast. Start off by making mozzarella dough for the base and sprinkle with the bacon toppings. Soon you will be able to enjoy this addictive low carb snack. Get the recipe here. We love simple recipes especially when it comes to snacks. In this Avocado Chips recipe from Delish, there are literally two steps to follow in the instructions. It couldn’t be any easier. Get the recipe here. What could be better than sharp cheddar cheese and bacon? These are so simple and delicious, you will want to prepare them every week. Bonus: Three of these Keto Cheddar Cheese and Bacon Balls by Diet Doctor contains only 2g net carbs. Get the recipe here. The one thing I love about these fritters is that you can basically eat them any time of day, not just as snacks. Kim from Low Carb Maven has great suggestions for what to eat these Low Carb Zucchini Fritters with if you want to make it into a nice meal. Get the recipe here. This Keto Cheese Shell Tacos recipe by Hey Keto Mama is one of those simply genius low carb recipes. We love her hack for making these cheese shells. Get the recipe here.